Floor mats are something you probably don’t think about very often. But if you consider the cost of replacement carpet for your car, floor mats suddenly become a fantastic value. Floor mats are required equipment when it comes to protecting your investment, especially if you live in an area that sees lots of winter weather. Without a good set of floor mats, slush and snow can soak into your car or truck carpet, through the carpet padding, and begin rusting out the floorpans–without you even knowing it! Protect your investment with these custom designed and color matched floor mats. Offer expires March 04, 2013 11:59pm (EDT). Please call 1-800-852-4216 for complete details. 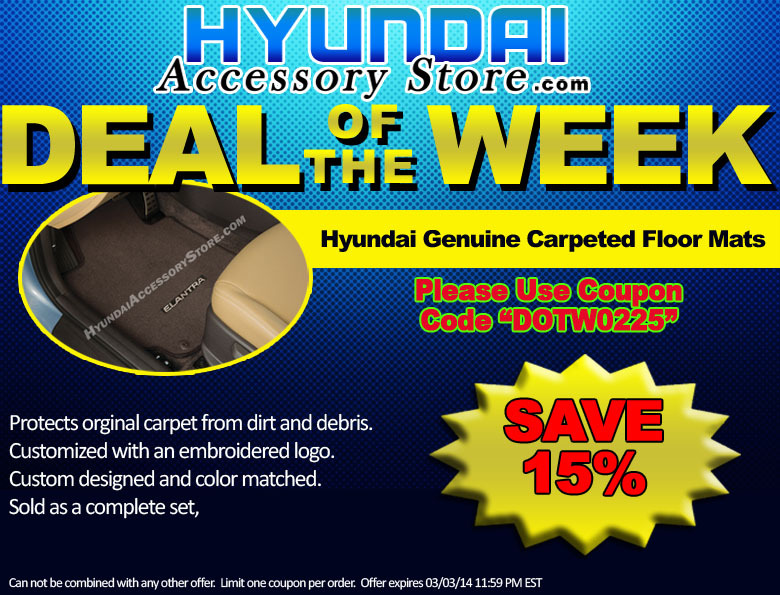 This entry was posted in Hyundai, Hyundai Accessory Store on February 25, 2014 by hasblog. 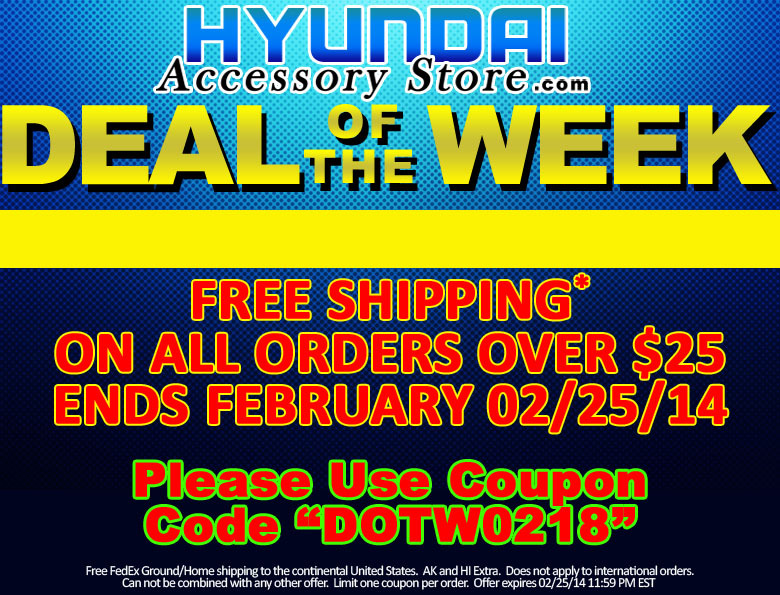 Offer expires February 25, 2013 11:59pm (EDT). Please call 1-800-852-4216 for complete details. This entry was posted in Hyundai, Hyundai Accessory Store on February 18, 2014 by hasblog. Offer expires February 18, 2013 11:59pm (EDT). Please call 1-800-852-4216 for complete details. 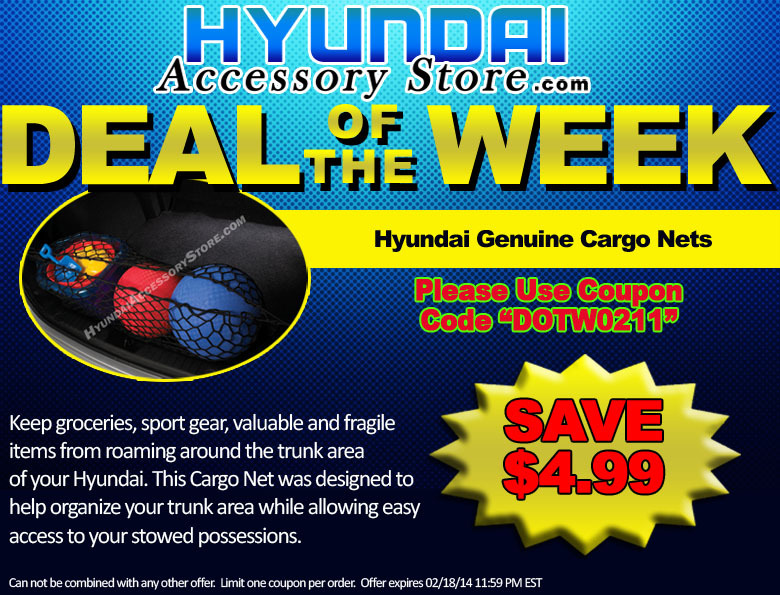 This entry was posted in Hyundai, Hyundai Accessory Store on February 11, 2014 by hasblog. Preserve the original carpeting of your Hyundai’s cargo area from wear and tear with there specially fitted cargo trays and mats. 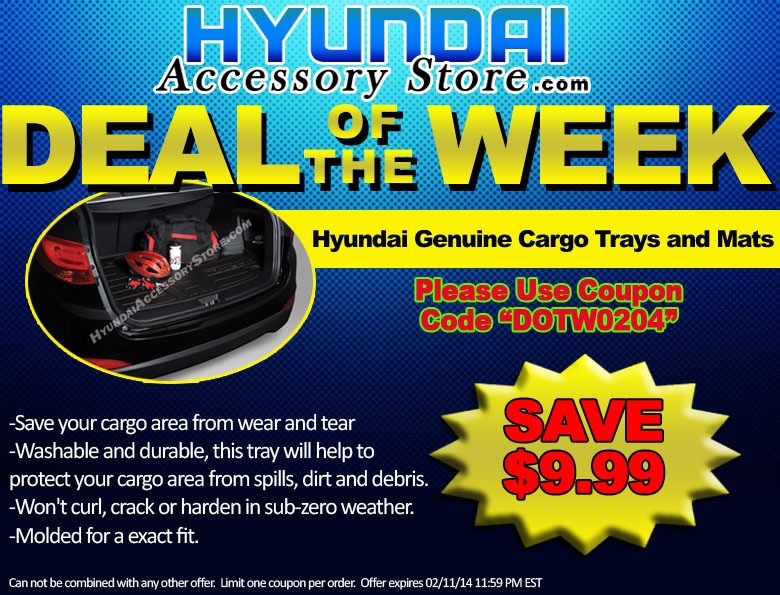 Washable and durable, this tray will help to protect your trunk area from spills, dirt and other debris. Offer expires February 11, 2013 11:59pm (EDT). Please call 1-800-852-4216 for complete details. This entry was posted in Hyundai, Hyundai Accessory Store on February 4, 2014 by hasblog.